Debras Random Rambles: Agnitus, fun Preschool learining for kids! 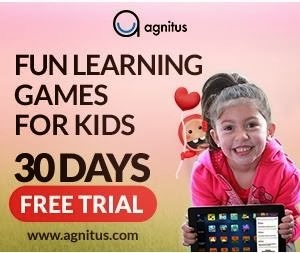 Agnitus.com – Personalized, FUN learning for children 2 – 8. Click Here! Children are naturally creative and they learn through play by seeing, touching, hearing, and doing. How many times do you have to tell them don't touch this and don't touch that? That is a way of them learning! These games are designed by education and technology experts. Agnitus ensures mastery of fundamental preschool and kindergarten skills. Plans are $6.99 a month, now that's a deal! And you can cancel at anytime. As a mom of twins, one of them special needs, I really liked this app! It was hard enough to pose a bit of a challenge to one and it was easy enough to not start a conflict or tantrum with the other. It was basic learning at a level they could actually learn. Not preachy like a teacher but fun like a computer or video game.